Castlebar - County Mayo - Mayo man launched leprechaun into space!! Mayo businessman Eoin Heverin has launched his leprechaun ‘My Buddy Mc Spuddy' into near space, some 36,000 metres above the earth. My Buddy McSpuddy has been described as the Irish version of ‘Elf on the Shelf' by Dragon's Den, Barry O'Sullivan, (who invested in Mr. Heverin's company). However, Mr Heverin believes McSpuddy is much more than that. "He is a best friend, a lucky charm and a promoter of good behaviour," said the Castlebar man. He is all set to be this year's must have toy and will literally take off in style. McSpuddy was sent hurtling into space attached to a large weather balloon as part of the launch of the toy. His journey was captured using a go-pro camera. Mr Heverin said he was asked by a friend on how he was going to launch his latest project and that's when the idea came to him: "I'm going to launch him into space!" He has put his latest project ‘My Buddy McSpuddy' on the Kickstarter website, which is the world's largest funding platform for creative projects. My Buddy McSpuddy is not an ordinary doll toy. He is your best friend and your lucky charm. He arrives in your house with his pot of gold and his 10 gold coins. You mind his pot of gold and he minds the gold coins in MagicLand; when you are good he will magically pop a gold coin into your pot. When you collect 10 gold coins you will receive a wish! McSpuddy will try to grant you one of your wishes from your Wish List that an adult can help you draw up. McSpuddy also has a ‘Worry Patch' and a ‘Good Luck' patch on his removable jacket. This is a feature that children who recently trialed the product really loved. It especially helped children who suffered from anxiety. They can rub McSpuddy's worry patch on his elbow and their worries will disappear. He also has many more wonderful features which add to his magic. 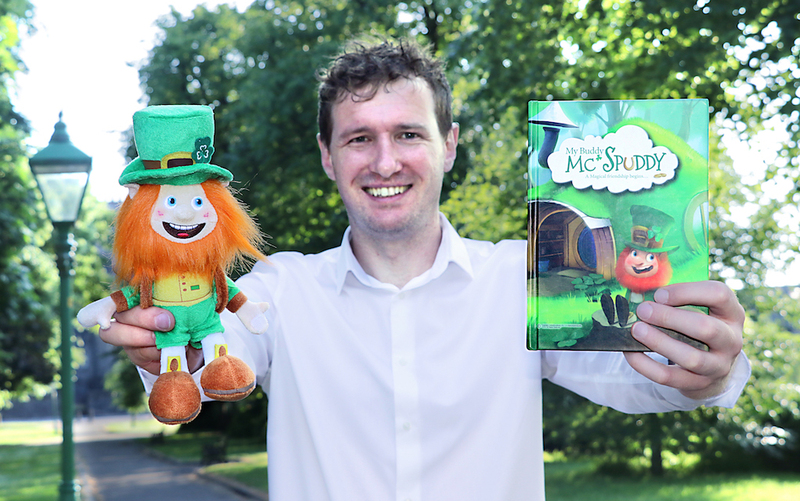 My Buddy McSpuddy will retail in all major toy shops later this year, however people have the chance to pre-order this Irish product by visiting kickstarter website. You can go to Kickstarter.com and search for ‘My Buddy McSpuddy'. The good news is you will get the full box set there at a greatly discounted and once off price on June 26th (limited amount available). And you will be supporting a 100% Irish owned business. Mr Heverin explains that it is McSpuddy's personal wish to go into space in search of his pot of gold. "McSpuddy lost his pot of gold, so he asked us to send him high into the sky, so he can look for a rainbow. He was convinced that he would find his pot of gold at the end of the rainbow. We granted McSpuddy his wish and sent him into space. Make sure to watch the space launch video on Kickstarter to see how he got on! Eoin Heverin previously appeared on RTÉ's Dragon's Den in May 2016, where he received investment from Dragon Barry O'Sullivan. Their company has grown since then and has launched their products with Arnotts last Christmas. However My Buddy McSpuddy has really got the team excited and they see him becoming a worldwide phenomenon. Go to the Kickstarter website to view the full video of McSpuddys trip into space! This is the My Buddy McSpuddy Kickstarter Page it will be active on the 26th June. And follow him on Facebook, Instagram, twitter and YouTube to follow his magical journey.